The effects of global warming have been felt more and more as the days go by. Radical climate changes, decline of sea levels and other forms of environmental degradation has led to a rampant awareness about pollutants and green house gases that are affecting the planet. Industrialization and technological advancements has contributed greatly to global warming. However, it is the same technological advancements that help us control and gradually reduce environmental pollution through the use of green cars which are popularly known as eco-friendly cars. Vehicles are man’s most used mode of transportation and have become a basic necessity in our lives. These vehicles however, largely contribute to pollution of the environment by emitting large portions of toxic waste. This has prompted the manufacture and distribution of eco-friendly cars which are quickly gaining popularity among the residents in the UK. Green cars are of two types, namely; electric cars and hybrid cars. The hybrid car runs on an engine that combines both electricity and hydrogen-based fuel better known as LPG (Liquefied Petroleum Gas). Below are some facts and benefits of using an electric or hybrid car. 1. Cheaper Mode of Transportation. 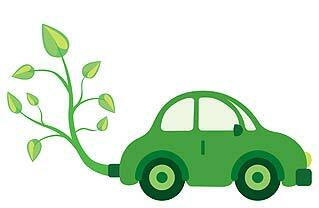 Green cars will help you cut a lot on fuel costs which seems to be on the increase on a daily basis. By owning either a hybrid or electric car, you will realize the efficiency from the first day of driving. Fewer trips to the gas pump for refills mean more savings both in time and finance. An electric car only needs to be charged for a couple of hours while a hybrid car gives you the option of saving up fuel by using the backed up electric power. Owning an eco-friendly car also means that you get to enjoy tax benefits provided for by the government by getting your car in tax deductions. 2. Play a Part in Saving the Earth. Being a proud owner of an eco-friendly car means that you care for Mother Nature and you play a role in ensuring that it is protected. Switch to a car that has better fuel efficiency gives you more miles on the gallon and greatly reduces carbon footprint. This will help the environment stay greener and you will also influence your family, friends and peers. Going green is the right cause! 3. Contribute to energy security. Most countries in the world depend on the Middle East for oil. The high demand and supply takes a big toil on oil reserves since oil is limited. By going green we play a vital role in the conservation of such reserves and ensuring that oil does not eventually run out. A lot of drivers are going green by purchasing either a hybrid car or an electric one. If you are thinking of driving one, use the dvla number to apply for your license. If you do not have yet then you can check out one of the following eco-friendly vehicles which are top 10 green cars in the UK 2013: BMW 13, Chevrolet Volt, Vauxhall Ampera, Volvo V60, Toyota Prius, Porsche Panamera, Toyota Yaris, Honda Insight, Peugeot 308, and the Renault Clio. Once you purchase one, make sure to register it through the dvla number and drive it proudly.